FILE - A SpaceX Falcon 9 rocket disappears into clouds after it lifted off on a supply mission to the International Space Station from historic launch pad 39A at the Kennedy Space Center in Cape Canaveral, Florida, Feb. 19, 2017. SpaceX plans to launch two paying passengers on a tourist trip around the moon next year using a spaceship under development for NASA astronauts and a heavy-lift rocket yet to be flown, the launch company announced on Monday. The launch of the first privately funded tourist flight beyond the orbit of the International Space Station is tentatively targeted for late 2018, Space Exploration Technologies Chief Executive Elon Musk told reporters on a conference call. Musk declined to identify the customers or say how much they would pay to fly on the weeklong mission, except to say that it is "nobody from Hollywood." He also said the two prospective space tourists, who know each other, have put down a "substantial" deposit and would undergo "extensive training before going on the mission." "I think there's a market for one or two of these per year," he said, estimating that space tourist fares charged by SpaceX could eventually contribute 10 to 20 percent of the company's revenue. Plans call for SpaceX's two-person lunar venture to fly some 300,000 to 400,000 miles (480,000 to 640,000 km) from Earth past the moon before Earth's gravity pulls the spacecraft back into the atmosphere for a parachute landing. That trajectory would be similar to NASA's 1968 Apollo 8 mission beyond the moon and back. NASA is hoping those crew-ferrying flights begin by late 2018. SpaceX's own Falcon Heavy rocket, which Musk wants to use for the lunar tourist mission, is scheduled to make a debut test flight later this year. 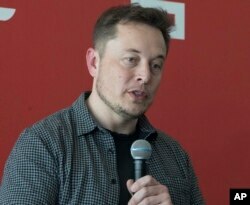 FILE - Tesla Motors CEO Elon Musk discusses the company's new Gigafactory in Sparks, Nevada, July 26, 2016. Virgin Galactic, an offshoot of Richard Branson's London-based Virgin Group, is testing a six-passenger, two-pilot spaceship to carry paying customers about 62 miles (100 km) above Earth, high enough to experience brief microgravity and see Earth's curvature against the blackness of space. SpaceX has a $70 billion backlog of about 70 missions for NASA and commercial customers. The firm's backers include Alphabet's Google and Fidelity Investments, which together have contributed $1 billion to Musk's firm.